Singapore Airlines (SIA) stories of stewardesses, stewards of more than 10 years by Boh Tong : A repost is not a bad idea after all. A repost is not a bad idea after all. The table above shows the number of pages of blog posts being read as at 5pm on 29 & 30 July 2014. "Sam had a good Christian boss.." has been read 84 times after I've posted it for a period of 19 hours. 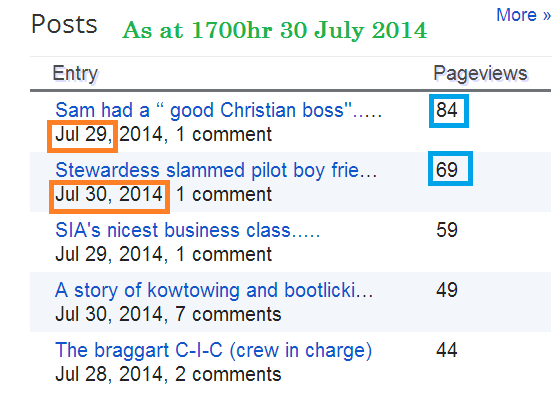 "Stewardess slammed pilot....." posted 9 hours ago has been read 69 times. The above 2 illustrations showed that reposting of stories aren't a bad thing. You may have read them before but there are others who've not. Therefore it's worth while reposting some stories especially those which are juicy, interesting and informative. What say you friends? Great minds do not come here and read Boh's blog. Only people like you who are shallow mind come here. Worst still you care to even comment.That shows what kind of shallow thinking you have. You are not much better than the person posting the first comment. A pot calling a kettle black. So why are you here also? I have been accused of having a shallow mind simply because I have posted threads that have been read many times over. The fact that they have been read many times indicate that they are the popular threads and many readers could have missed them. What's the point of re-posting threads that were hardly read as read as suggested by the first Anonymous? It's not about who is having great or shallow mind. Second Anonymous is wrong to state "great minds do not come here to read Boh's blog". All great and shallow minded people have been here before and some even commented positively. Great to see you post. I did not read your earlier posts, good to repost. Based on Jacky's posting and comments, it reiterate the fact that lesser read post should be repost and not posts that have been read many times!